It’s 9:00 a.m. on a Saturday morning, and Mary I. Setterholm sits at a table in the Rock Café at the Divinity School, one arm in a brace—a bike accident, she explains—and the other deftly scooping Stonyfield yogurt. 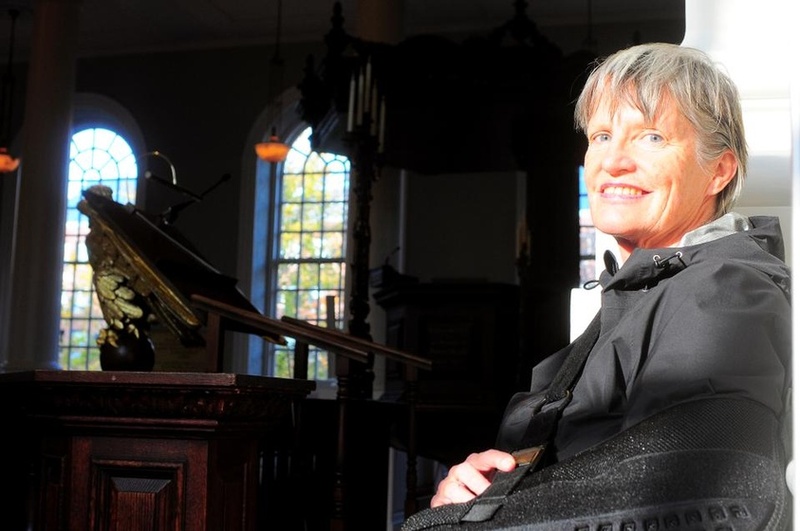 At the age of 57, Setterholm carries herself with the poise and confidence of a professor, but she is a student, currently pursuing her Master of Divinity degree at HDS. Setterholm took a non-traditional and difficult path to Cambridge, marked by an unstable family, an abusive marriage, and periods of prostitution. A former U.S. Surfing champion, Setterholm seeks to understand women’s issues, poverty, and prostitution with the same intensity that drove her to success in the water. Born in Angelino, Calif., Setterholm never expected to end up at the Divinity School. She was raised with a deep love for the ocean, winning the United States Surfing Championship in 1972, at the age of 17. “The only thing on my mind was, when’s the next swell, chasing waves—that was it. There was no need for this!” she exclaims, waving her uninjured arm. But, drawing on her theological studies, she notes that, on an abstract level, there is a deep connection between surfing and theology. “Existentially, surfing is the happening of theology: You are both engaged and surrendered to the sea. To survive you can’t posture—it won’t cut it,” she says. The issue of dignity is a priority for Setterholm, who notes that the Serenity Sisters frequently speak of their experience as one of necessity. “You know what they’ll say? ‘I had to do what I had to do.’ Tell me if there’s no dignity in that. That’s the Protestant work ethic in a nutshell,” she says, lightly slapping the table for emphasis. Setterholm tried for years to obtain a Bachelor of Arts degree, but an abusive marriage hindered her studies, and she temporarily gave up on the idea of college. “I didn’t think I would ever get a B.A., and so I made peace with it and started a surf school. I thought, I’m a dyed-in-the-wool surfer, and I’ll go back,” she says. The school Setterholm established in Southern California now employs over 100 people. Setterholm grew close to a nun at the Los Angeles Archdiocese, who later persuaded her to return to school and mentored her throughout her undergraduate program. She obtained a B.A. in 2009 and then landed herself first at Union Theological Seminary, affiliated with Columbia University, before transferring to HDS. Now, she is an academic powerhouse: This year Setterholm was one of six HDS students to win the Hopkins Shareholder Award in recognition for her ministerial promise. Setterholm’s ambitions lie beyond simply absorbing knowledge from her professors and textbooks. She says that her personal experience has made her more suspicious and inquisitive of the texts before her and less likely to accept them as truth. “I’m a footnote junkie!” she proclaims. “Half the time it [the item footnoted] is completely taken out of context, and then I want to throw the book against the wall, and I’m pissed. What the hell?” she exclaims, tossing her hand up in the air in frustration. A student walks into the café and waves at Setterholm, who immediately waves her raised hand and smiles back. Setterholm pauses for a moment and looks down as she considers why she decided to attend the Divinity School. “There’s a jump-off point where science only takes you so far, and people have a need for something a little deeper than that,” she muses. Through her studies, Setterholm aims to better understand women’s issues, especially as they relate to ethics and histories in society. “And obviously the curious cousin of prostitution,” she adds. Setterholm seeks to create a women’s center after she graduates, but for now, she feels fulfilled in the classroom. “School is my home,” she says. “I’m grateful beyond—” she begins and trails off as she searches for the next word. Seconds tick by.